It’s time for One Piece chapter 878 to release. Until, it airs let’s go through its spoilers, summay/synopsis, and predictions. The OP manga trailer/promo will be updated as it releases. As of now, the team is on a break. The upcoming segment will air on September 14, 2017. So, we (fans) have no choice than wait. The previous chapter ended on a cliffhanger hinting some plausible upcoming storylines / plot for the next installment. In OP 877, The Straw Hats were left trapped on land with Big Mom. The escape route for Sunny was blocked because of Big Mom’s ships. But, he seems to have found a possible way to clear his route. This method can instantly place ships out of reach from the Yonko’s forces. 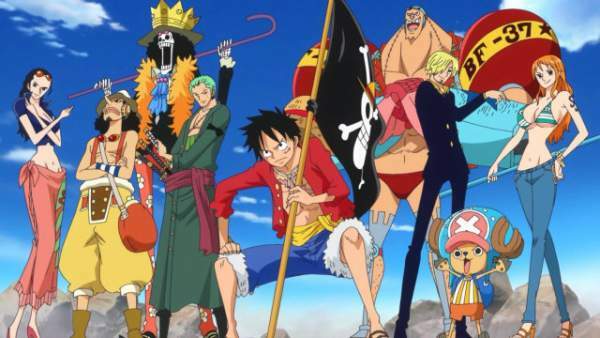 There are predictions that the Straw Hats may employ Thousand Sunny’s signature move ‘Coup de Burst’ in One Piece 878. This movie can allow the ship to get away from her enemies quickly. If they launch a giant cannon downward, it will move the Sunny one kilometer into the air. However, there is one restriction which is not allowing the move. The reason is Perospero has turned the sea into some kind of sticky candy. Pedro let the Luffy and his crew escape at the cost of his life. So, he is planning to kill Perospero to nullify his technique. It’s gonna be a suicide move as the bombs are attached to his body. If he gets successful in killing him with explosions, it would result in turning the sea back into normal. Then, it will allow Coup de Burst to take place. Moreover, it will also prevent Brook and Chopper from turning into candies. Another thing which can happen in chapter 878 of One Piece is that a fight may take place between Luffy and Katakuri. In the last segment, we got to see a technique of Katakuri similar to that of Luffy. So, it left fans wondering what could be the result of a fight if it takes place between the two. In One Piece 877, Sanji, Pudding, and Chiffon were left out. In a plausible plot, they could try to bake a cake to stop Big Mom’s tantrums. However, most of the fans won’t be interesting in watching an entire episode dedicated to cake baking. So, Oda and his team would keep their culinary adventures to a minimum. Stay tuned to TheReporterTimes for more updates on One Piece chapter 878.